New Market Tax Credits offered through the Montana-Idaho Community Development Corporation have helped a number of projects move forward across the state, including the Billings Office Building, the Historic Sears Building in Butte, and the Poverello Center in Missoula. A group of community leaders gathered in a Midtown office building on Wednesday to learn more about New Market Tax Credits and how they might be applied to revitalize the Midtown district as it looks toward the future. Through the Montana-Idaho Community Development Corporation, the credits have been applied in Missoula before, from the Garlington building downtown to the Poverello Center and the new Missoula Food Bank. But together, they represent just three of the 35 projects completed by the nonprofit lending institution over the past few years. Community leaders would like to see that number increase as Midtown transforms on the heels of the new Brooks Street Corridor Study, released last month. Since 2008, the U.S. Treasury has awarded the Montana-Idaho CDC roughly $431 million in New Market Tax Credits to create jobs and economic opportunities, from revitalizing uptown Butte to expanding the Golden Valley Naturals beef jerky factory in Idaho. 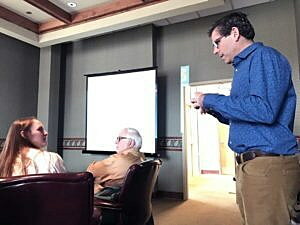 On Wednesday, the organization’s president, Dave Glaser, encouraged business owners and members of the Midtown Association to consider New Market Tax Credits as they look to the future, one that’s likely to see the district evolve with housing and new economic opportunities. To qualify for New Market Tax Credits, a project must be located in a “low income” census tract, which includes nearly all of Missoula, and it must offer a high community impact. The total project must also exceed $4 million in value, and at least 25 percent of the income from the completed project must come from commercial use. That requirement fits well with the Midtown vision, one that could see mix-used development with housing built atop ground-floor retail. General commercial projects completed across the state have included the Red Lion Hotel in Polson, the Historic Sears Building in Butte, and the Crowley Fleck Building in Helena. While Helena, Butte and Rexburg, Idaho, have seen the most success with New Market Tax Credits, property owners and developers in the Midtown district may consider the credits as they explore future projects. “If there’s a project you see when you drive around Midtown, you might say it’s possible,” said Andy Short, a member of the Midtown Association and a land-use planner with Territorial Landworks. “I’m a business owner right next door, and we all want to see the success of Midtown.